When I began to fundraise, I would run from event to event trying to recruit new donors and raise funds. As you can imagine, this strategy is tiresome after a while. Soon, I no longer had nights and some weekends to myself because those precious moments are also when most people are available to meet with me. Was I following misconceptions that really didn’t work? I quickly felt drained and unmotivated by my work. Even my friends and family were feeling the stress because either I wasn’t with them or when I was, I was too tired to be fully present. Something had to change. I looked into different ways of attracting donors that didn’t require me, or my team, running around. I wanted to find a way where we could meet people, find donors, reach our fundraising goal, stay focused on our work, and, most importantly, enjoy time with family and friends. My research led me to look at the benefits of using more efficiently the internet and social media for attracting donors. I discovered that with a few adjustments, I could attract more people to a website and social media than I had been by meeting people at their parishes or community centers. I thought this was a breakthrough because, among all those people connecting with us online, there were bound to be new donors. Now, I had to answer the next big question: how do I get them to donate? Like most organizations do, I placed prominently the donate button on my homepage for everyone to see and waited patiently for the donations to roll in. As more and more people visited my site each month, I thought the donations would be pour in eventually. This unfortunately never happened. I learned that an increase in website traffic and social media engagement doesn’t result in more donations. 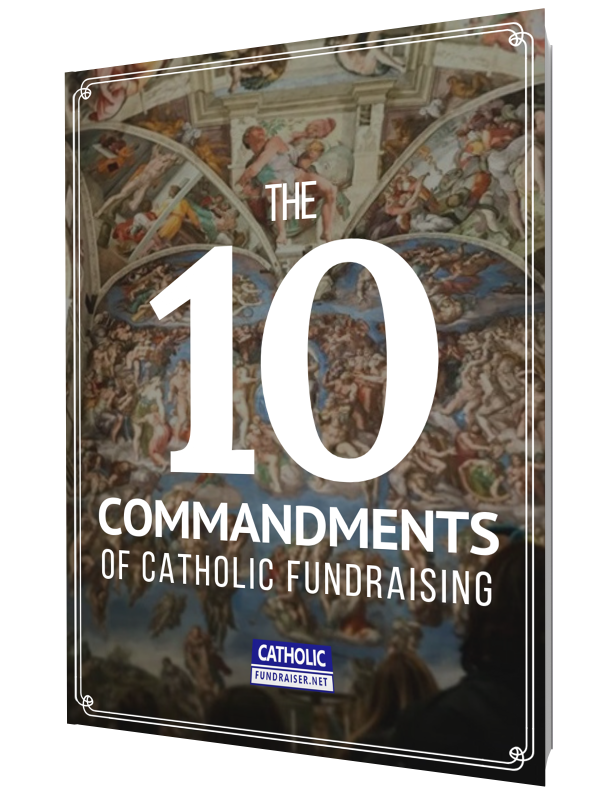 At first, I was worried that I would have to return to the old way of fundraising, running from one event to another. I didn’t want to go back to that lifestyle, so I did some more research. Pope Paul VI wrote this in 1976, just at the start of the technology boom. He inspired me to dig deeper. I had a hunch that he was right. I just had to keep going, and, after a little more trial and error, I found the answer. It was a eureka moment. I had been making false assumptions about how the internet works. Yes, people did engage with my online content because they were interested in what I do; however, they were not (at least not yet) ready to donate. I learned four misconceptions about the internet which have helped me use it more effectively in getting donations. Misconception 1: Just because you have a donate button doesn’t mean people will give. In reality, you will be lucky if 1%-3% of the people who visit your website will give. People don’t browse your pages looking to give. Rather, they want to learn about your work and how to get involved. They want to connect with you, not give you money. Therefore, if you focus on engagement, offering them ways to physically get involved, rather than financially, you can, later on, ask for a donation. Misconception 2: The internet is impersonal and not useful in building relationships. With how technology has evolved in recent years, the internet has become even more personal. With social media and web applications, you can connect directly with people, regardless of their location or numbers. Some applications even allow you to chat instantly through your website. By leveraging technology like you would a phone or video camera, you can directly communication with someone, offering them what they really want, a relationship with you and your work. Misconception 3: I don’t have time for the internet and websites. I have to focus on my work. Your job involves connecting with people, sharing your message, inspiring them to help you, and transforming lives. The internet helps you do this on a much larger scale because it is available to anyone and everyone, 24/7 wherever there is a connection. Also, the days of expensive and laborious web design are long gone. Today, a website can be developed and maintained with minimal cost and effort. Also, connecting with people online is less expensive than depending on events, phone calls, and mailings. Misconception 4: The internet and social media are just not for me. The internet offers you the ability to connect with over one billion people. Would it not be prudent to assume that among this vast number there are Catholics who would be interested in you and your work? With a little bit of work to set up your online presence, you can connect with all of these people. Embracing the change which the internet brings expands our capacity to reach more people. Check out the article I wrote on why changing the way you fundraise is important. After learning these four misconceptions, the next question was: If I can attract lots of people to my work through the web, how can I get them to give eventually? I turned my attention to improving the two things a website does well: instigating a connection with lots of people and then allowing me the opportunity to build a relationship with them. With the help of website applications and social media platforms, I turned my online presence into a portal of interaction. Instead of asking people to donate, I invited them to my events, asked them to volunteer, and gave them free resources so they can get involved. If you are a parish, diocese or religious order, check out my previous article on the 5 simple steps you can take to improve your website. It offers practical and concrete recommendations for getting started. Therefore, instead of running around meeting people, the internet was finding them for me and getting to me where I was. I no longer had to run from one event to another. Instead, I could meet people face to face, build a relationship, and then ask for donations. This was the biggest lesson I learned. People were only ready to donate to me after having met me in person or built a level of trust in what I do. As I met more people passionate about my work, their trust in what I do picked up as did donations. This was fantastic because in trying to fix one problem, I also improved other elements of my organization. All my events were fully booked. I had an army of volunteers. Most importantly, I and my team were not running around anymore because people were coming to where we were. I’ve been perfecting how to leverage the internet to attract donors for a while now. The other day I was reviewing the website statistics for a charity I help. Last year they had difficulty filling up their biggest event of the year. It’s the hallmark event that, if goes well, increases their visibility to a lot of people, especially large grant makers, key influencers in their work, and major donors. So, they wanted to make sure everything went smoothly. For the past year, we had been building their online presence. As a result, the event was fully booked a month in advance and had a substantial waiting list. Also, because we were not worried about getting enough people to attend, we then focused on using real-time video to broadcast the event live via social media. Now, an event that had been planned to have 200 people attend will be seen by thousands. We were bound to make this the most successful event possible, planting as many seeds as possible for future donations. The bottom line is this: You can either continue running from event to event to meet people where they are, eating up your personal time (sometimes on Sunday when you should actually enjoy the Sabbath with friends and family), as you look for donors, or you can embrace the opportunities the internet provides. You may think that the web means instant donations without meeting people. It doesn’t. Increasing your donors and donations still come from meeting people, connecting with them, and asking them to be part of your future. Though the real difference is this. Instead of chasing people for donations, people will find you and want to donate. It’s here where the magic happens, so be prepared to welcome many more people on your journey. If you have questions about improving your web and social presence, send me an email and let’s get you moving forward today. Discussion Question: What misconceptions do you have about the internet? In what way could this be a sign for you to leverage the web more?